Last night was the finale of the horrid MTV Show (redundant phrase) “Jersey Shore.” I already told readers what I think of this crappy waste of time that mocks Italian Americans in a way MTV (and everyone else) would never have the guts to do with Muslims or Arabs in America. I’m all against PC, but only if there’s no PC for anyone, not just for some groups and not others. But I found this “Shore Speak Dictionary” to be somewhat entertaining in a mind-numbing, IQ-lowering way . . . especially since a lot of “their” terms are hardly original. “Heated” as a way of describing extreme anger isn’t their invention. What–they never heard of phrases like “heated conversation” or “heated argument”? Also disgusting: that these morons have the nerve to compare themselves to Navy SEALs on the battlefield. Still, I gotta say, I like the term “Grenade,” as in Michelle LaVaughn Robinson Hussein Obama Idi Amin Dada is the First Grenade. 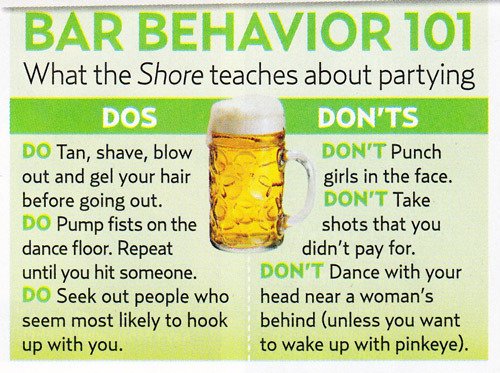 The “Bar Behavior 101” rules, which follow the Shore Speak item, below, are kind of hilarious, as in, do they really not know not to punch girls in the face or take shots you didn’t pay for, and they need rules on this? Can’t wait ’til this show hits the 15-minutes-are-up dustbin along with Clara Peller, Rubik’s Cube, and Joe Millionaire (though each of those were infinitely more worthy of a look than “Jersey Shore”). As an American of Italian heritage, this piece of MTV/Viacom/CBS crap, IS FAR FAR FARRRRRRRRRRRRRRRRRRRRRRRRRRRR OFFENSIVE! MAY THE EXECS WHO GREENLIGHTED THIS CRAP PRODUCE INFOMERCIALS THE REST OF THEIR CAREER! It doesn’t sound good when people call the way people act as offensive to ones race or heritage. I understand it to a point but face it, these are how some italian americans live. MTV thought it would be entertaining and it was. I watched every episode sometimes it got a little boring but it was entertaining. I thought they were good kids and just liked to have a good time. Whats so offensive or abnormal about that? I am diagnosed with psychophrenia, I hear voices, I’m stereotyed to hell. People think I’m insane and might be a killer without even talking to me. I don’t say hey stop implying pshychophrinics are bums and crazy people. My situation is a lot worst than people thinking your a guido. “DON’T dance with your head near a woman’s behind (unless you want to wake up with pinkeye)” GROSS!! I take it someone on the show got some pinkeye. Leave all that behavior on the East Coast. At least California’s shores is more laid back. Our shores have stoned surfers who don’t walk around like freaks on Juice. Me thinks a lot of those stoned surfers are the ones who write the California state budget! I am beginning appreciate the intellectual stimulation of a test pattern on a screen now. indeed this is disgusting, we need to consider the source, like who owns mtv/vh1 etc. and think a long while about our young people-they are lost lost lost souls. you can get pinkeye from a girls’ behind? what i found most interesting about these jersey shore characters was how flat-out stupid they all were. Don’t say people are stupid if you no better and keep yourself clever sometimes .If you hate jersey shore why the hell you watching it just don’t watch It and people don’t think all italians are like that , on the first ever jersey shore episode the crew even said that they don’t represent all italians and that all italians are different.And they not stupid some of them did finish there education like nicole who likes helping animals. Honestly, whining about lack of taste or intelligence of MTV is a bit pointless. Then again, I can use this guide to the stupidity & ugliness that is Jersey. As far as I am concerned, there are three types of humanoid lifeforms in Jersey: mall walking zombies, corporate suburban robots & Soprano wannabee lowlifes. While this is still up, just saw this parody of the Jersey Shore. Hillarious. I remember back when MTV was sort of cool. That was a long time ago. It hasn’t been worth watching since they stopped producing episodes of _Daria_. speaking of tv shows, look whats happened to ’24’. Using Russians instead of muslim terrorists as the bad guys. And wow!making obviously Irans leader look like a nice man. In the beginning they did use muslim terrorists, but it was too politically incorrect. Ah sadly I don’t think MTV is mocking them. What is there to to when all they have to do is just keep the camera on? This is reality for some people and if you’ve ever been to the Jersey Shore during the summer it’s kind of accurate. Sad. I’m from Seaside Heights most of my life. I left in 02 for the Army. We(locals) hated guys like those on the show. They come from North Jersey and NY in the summer and go crazy. they each get paid 10 grand an episode for season 2 and will get paid 30 grand each per episode for season 3!!! Litle more positive for a change u sound so republican. What’s a Snooky?? And what kind of Situation do they mean? Actually, given this crap, Obama’s forced ‘community service’ for late teens and twenty-somethings doesn’t seem a such bad idea. (What a f****** choice).